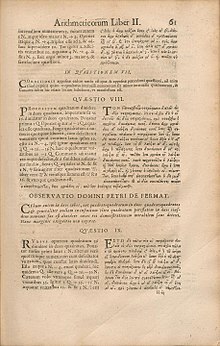 The 1670 edeetion o Diophantus' Arithmetica includes Fermat's commentary, pairteecularly his "Last Theorem" (Observatio Domini Petri de Fermat). In nummer theory, Fermat's Last Theorem (sometimes cried Fermat's conjecture, especially in aulder texts) states that no three positive integers a, b, an c satisfy the equation an + bn = cn for ony integer value o n strictly greater nor twa. This page wis last eeditit on 5 Apryle 2016, at 02:11.